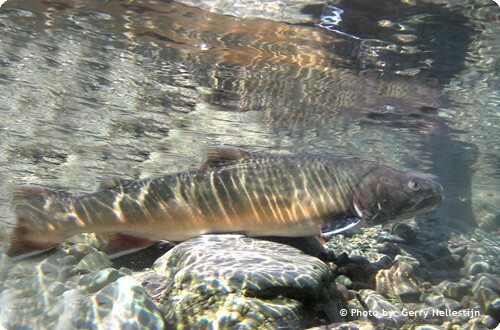 Bull trout (Salvalinus confluentus) are a blue listed (threatened) 'species of concern' in British Columbia. It’s a trout-like char with pale pink to red coloured spots along its flanks. They can often be mistaken as "Dolly Varden" ("Dollies") or brook trout. They are easily distinguished from brook trout by the lack of colouration on their dorsal fin. Brook trout have black 'vermiculations' on their dorsal. Anglers and fisheries managers often use the slogan 'no black, put them back' as a conservation strategy for bull trout. Bull trout are very thermally sensitive. They need cold water, they can live for as long as 24 years and grow to upwards of a metre in length. Bull trout are native to western North America and were originally distributed from northern California to the headwaters of BC’s Yukon River system, west from the Upper Missouri to the BC coast. In the Canadian Columbia Basin they are widely distributed in the Kootenay River/Lake tributaries as well as in the Arrow Reservoir system. An important but vulnerable population of bull trout within the Pend d’Oreille system exists in the Salmo River Watershed. Require cold water systems but are adapted to a large variety of life history patterns. Can exist as stream-resident fish in small headwater rivers or streams or as adfluvial fish that migrate from lake-headed systems into rivers or headwater tributaries to spawn. They also live in fluvial (river) environments. Like all char, bull trout are fall spawners and females build a redd (fish nest) in flowing water in large gravel substrate. These redds, depending on her size, can be close to a metre wide and 1.5 metres long. The females dig a pit at the upstream end that forms a mound at the downstream end in which they will deposit up to 10,000 eggs. During final stages of redd building she will be protected by her spawning partner. Males can undergo dramatic changes during spawning, forming an exaggerated back shape, increased colouration and a “kype” which is an upturned hook at the tip of the lower jaw. Bull trout usually migrate to cool headwater areas to spawn after the end of July. They typically spawn from mid September to mid October. Spawning requires 9°C water temperature or less. Fragmentation of river networks by dams. Competition from non-native species (brook trout). For more information on this species, visit The Species at Risk Public Registry and/or The BC Species and Ecosystem Explorer where you should enter "bull trout" in the species Name field.